When I think about all the gear interior attack teams carried with them 15 years ago and what they have with them today, it’s worlds apart. 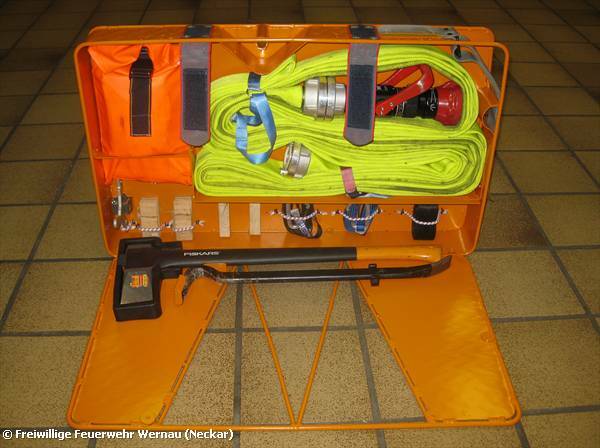 The Wernau Fire Department had similar thoughts, which is why they developed the aitttack hose basket. It is intended to relieve the interior attack teams and carry important tools. The exciting thing about doing research on the internet is that you keep coming across various fire departments’ interesting ideas and developments. 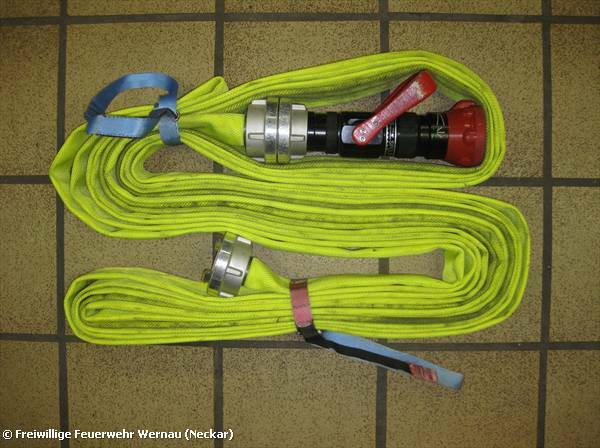 For example, a few weeks ago, I found the Wernau VFD attack hose basket (AHB). I’m a fan of useful additional equipment for interior fire attacks. Whether it’s a rescue knife, a thermal imaging camera, an escape hood, an axe or a Halligan tool. They all serve a purpose. But this means a two-person attack squad can barely move and won’t have any free hands. So it makes sense to think about how you can have all your equipment right there and also avoid forgetting important things. The Wernau Fire Department’s answer to this dilemma is the attack hose basket, or AHB, which is a rebuilt hose basket that carries all the important equipment for an interior attack. The Wernau Fire Department’s own Fabian Burkart was nice enough to let me ask him a few questions about the self-developed AHB. Fabian, how did the idea for the attack hose basket come about? We became aware of the issue of the attack teams taking more and more equipment to an interior attack. So then the idea of packing all the necessary equipment together in a suitable way was born. By using a hose basket, an inherently stabile and clearly laid-out arrangement was put into effect. Also, reconstruction at the vehicle isn’t necessary anymore. Who rebuilt the hose basket, and how did you guys do it? It was all active work done by our firefighters. We split up the storage space within the basket. This way, we are able toalso store, aside from the hose itself, equipment such as a fog nozzle, irons, or a flame protection hood. Do you use less hoses now for an initial attack? We only use the AHB in connection with an additional “normal” hose basket. It used to be two hose baskets with a 3 x 15 meter hose, so 90 meters altogether. 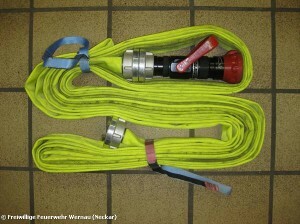 Today, we take one 1 x 20 AHB and one 4 x 15 meter hose basket with us for the first strike, which gives us 80 meters total. Of course, as is the norm, the captain still has to estimate the need and, if necessary, bring even more tubing. Any positive experiences yet with the AHB, and how many are you guys currently using? Currently we only have one attack hose basket. Because we are introducing the AHB simultaneously with the hose package, we first wanted to train all the interior attack teams. This happened throughout the last six months, and the feedback was consistently positive. The basket is considered a relief because all the needed equipment is always within reach. The expected time advantage during preparation at the vehicle has been confirmed. During the next few days, we will load the AHB onto our engine and start using it. Are you planning on marketing the AHB, too? Or is it just going to be an internal development? We have decided against patenting it, so anybody can use our idea and rebuild a basket without patent concerns. But we are certainly not opposed to marketing, and manufacturers are welcome to approach us. Are there any other improvements for the AHB you guys are planning on making? Not right now. We have been consistently improving the basket for the last two years until we reached its current design. It might not be bad if it weighed a little less, but without having to take away some of the equipment, I just don’t see where we can take away weight. All in all, I would say that currently we have a very well-optimized basket. The interior attack team gets ready during the drive to an incident location and, after receiving the order, grabs the AHB as well as an additional hose basket. “Aimlessly” circling the aparatus and looking for all the equipment is now prevented so that precious time can be saved after arriving at the scene of the incident. As always, the interior attack team starts at the distributor. Here, it lays down its attack line via the hose package to the spot where it then lays the hose reserves (for example, at the door of a burning apartment). Now the firefighters open the attack hose basket’s side wall, which can be folded open, take out the hose package, attach it to the laid line, secure the line with an endless sling, and start to run the water through the line. 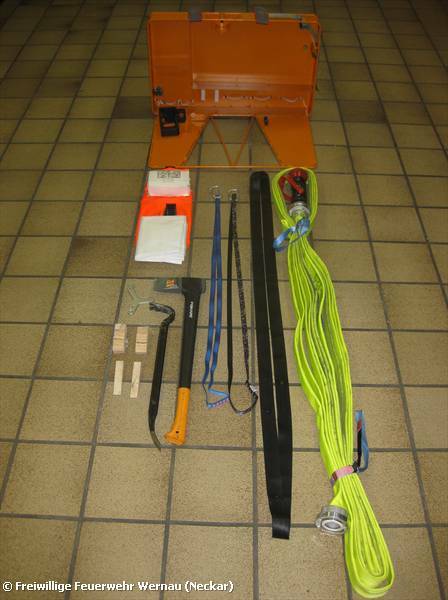 The team can now grab the tool from the AHB and use it to break open the door. An additional endless sling can be attached to the door knob to close the door again, if necessary. The door can be secured with a wedge. The linen pouch with the wrap and the fire escape hood can be hung around the air cylinder, for example; the cleaver should be carried in one hand and used as a search aid. The hose basket and the AHB are left at the entrance to the apartment along with the rest of the contents; all the items can still be accessed quickly. Whenever only some of the equipment (tools, for example) is needed out of the AHB, without the hose reserves already being laid at this spot, it can, of course, be taken out of the AHB, used, and stored in the AHB again afterwards. Thanks so much, Fabian, for the detailed answers to all my questions. If you guys have any interesting ideas or internal developments, I’d love to hear about them in an e-mail. And: “…sichert die Leitung mit einer Bandschlinge und fordert Wasser auf die Leitung an”. = “…and start to run water through the line.” Is that right? Der Beitrag wurde am Wednesday, den 11. August 2010 um 09:40 Uhr veröffentlicht und wurde unter Firefighting Topics abgelegt. du kannst die Kommentare zu diesen Eintrag durch den RSS 2.0 Feed verfolgen. du kannst einen Kommentar schreiben, oder einen Trackback auf deiner Seite einrichten. I’m an engineer on a large motor yacht and am very interested in obtaining an AHB. Where can I purchase one please?